PIA 777 will visit EGNM as recently signed (more info) which will replace the current PIA Airbus A310. Easyjet and British Airways Airbus A319 flights will be introduced. COSMO, Olympic and Monarch Airbus A320 flights will be introduced. New 757 livery to represent the new Jet2.com Holidays. Hoping to include Winter 2013 timetable as well. A new AFCAD (updated to reflect EGNM in todays world - limitations due to scenery). See the AFCADs project page for details on this. i.e. 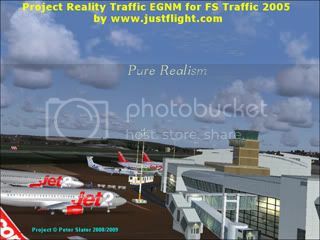 There will be a version available for those who do not own FS Traffic 2005 by Just Flight. Hence, 'standalone'. I cannot provide any start or completion dates due to current life commitments at the moment. Possible AFCAD update for use with this project. View my AFCAD projects page. Adobe Flash Player is required to view the video below. To view my promotional video click on the YouTube logo to your left. Please rate and comment if you have an account as it is much appreciated.